There is a giant NCL ship docked beside us this morning at Port Klang. She arrived first with 3,500 passengers aboard, so the shore resources are swamped. This delays the clearance of our ship, and the departure times for the shore excursions end up being almost an hour later than planned. 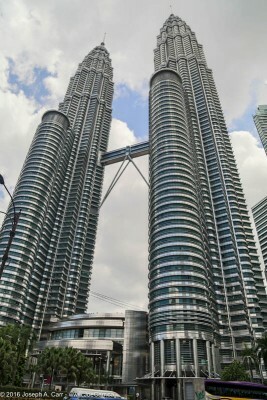 We finally leave to board our buses and start the hour long drive through heavy traffic to Kuala Lumpur (KL). The first stop on today’s shore excursion is a Hindu shrine, the Batu Caves. It is built into a huge Karst rock sticking up in the small community of Gombak, just north of KL. I take both video and lots of photos of the stairway of 272 steep steps up to the cavern containing religious temples and statutory. Using HDR and my fisheye lens are both helpful to capture this place. There are monkeys everywhere, and people are feeding them bananas of all things! Guess where the monkeys leave the peels…right on the steep steps! The caves at the top are interesting and well-lit, and have some shrines for the faithful. Since we had a late start, lunch is our next stop: a sumptuous buffet in a local upscale hotel, the Concorde Hotel. We then make our way to the KL Tower, where we have to wait in what seem to be endless lines to take the elevators to the observation deck. Once there, the views of the city are spectacular! 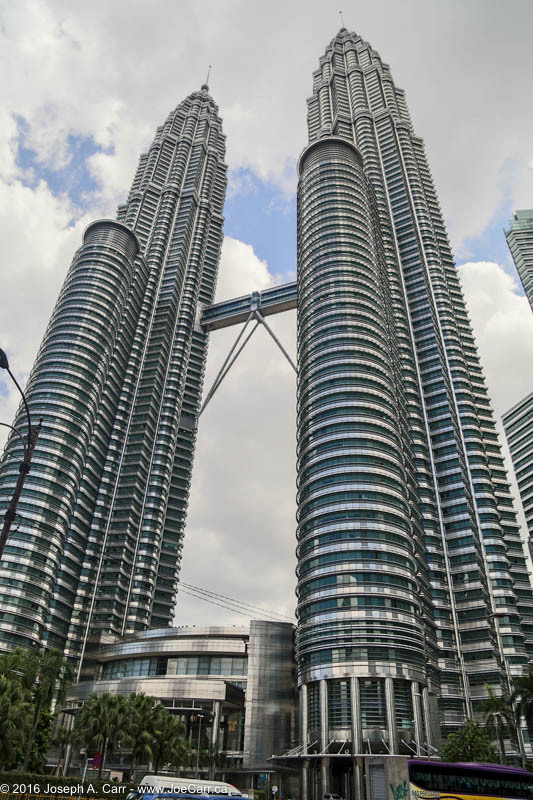 By this time, we are running very late, so we make a quick photo stop at the Petronas twin towers, and can only stop at the Muzium Negara for a half hour. There are some very interesting historical artifacts in the museum, but we really don’t have time to appreciate them. Our last stop of the day is Independence Square, which offers us obstructed views of quite a few colonial buildings, as well as a cricket field, and other old buildings we have no time to explore. Our tour is supposed to end at the cruise ship terminal at 4:30PM, but is is a full hour later before we finally arrive after battling traffic congestion most of the day. Not that it matters much to us as passengers, since the ship is not scheduled to depart until 10:30PM. Warisan Seni Budaya are a Malaysian dance troupe who come aboard the ship this evening and perform some fascinating dances reflecting the mixed cultures to be found in Malaysia: Malay, Chinese, Indian, Sarawak, and Sabah. A young dancer struts around the stage in a peacock costume, and their performance ends with a combo of all the ethnic groups dancing together. This entry was posted in Malaysia and tagged building, dancers, monkey, shrine, skyscraper, statue, temple, tower. Bookmark the permalink.